Navigators know how important drinking water is. Especially those who enjoy long cruises and prefer to sleep at anchor rather than in port without having to worry about filling the tanks every time. Getting fresh water is much easier than it seems, you just need to install a desalinator that turns sea water into drinking water. Tecnicomar is a leading company that for more than 40 years has been creating practical ways of making water drinkable using advanced design and construction technologies and the inverse osmosis process. For the marine sector, desalinators are designed and produced for all kinds of vessel, from sailing boats to big superyachts, from cruise ships to merchant ships and offshore platforms. The company also produces systems for industrial, civil and military use, for islands and villages. Its desalinators comprise an enormous range and can be applied virtually anywhere, thanks to a high level of customisation. Among the strong points of these important “machines” are the small size, low energy consumption and the amount of freshwater produced. Maximum attention is also paid to installation, which is very simple, and to maintenance, which rarely involves extraordinary interventions. Let’s look now in detail at the company’s leading products for the marine sector. 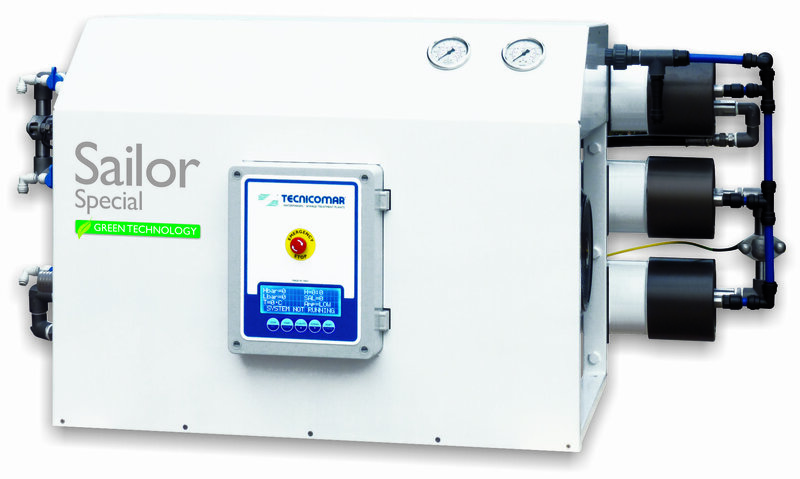 The Tecnicomar Sailor Special Green series of desalinators uses the physical principle of inverse osmosis and has been designed to reduce the energy requirement per litre of freshwater produced. Thanks to an overall improvement and the installation of innovative membranes, the system permits energy savings of 35% compared with conventional inverse osmosis plants, while producing 60% more drinking water. Tecnicomar Sailor Special Green is simple to use and has high quality components, like the high-pressure pump in stainless steel with ceramic piston, the stainless steel powder painted frame, filters and membranes that conform to FDA, NSF and ANSI standards and high pressure vessels in TUV certified carbon fibre and A.S.M.E. certified glass fibre. The standard configurations is full-optional and ready to install, with a device for automatically adjusting the pressure and an installation kit. On request, it can be supplied with an automatic membrane flow system and a remote control. Tecnicomar ECOmar is a system for treating black and grey water and has a capacity from 2000 to 54,500 L per day. The system is supplied with an approval certificate issued by Lloyd’s register conforming to IMO / MARPOL no. MEPC.227 (64) regulations, European directive 96/98 / EC (MED) and later modifications, accepted by the US Coast Guard. Made up of the central body in AISI 316L stainless steel and available in robust polypropylene (models 20, 32 and 45). All models are designed and built to work in extreme temperature and vibration conditions and have a high degree of reliability and very low energy consumption. The control panel with its microprocessor has an LCD display and manages the fully automatic operation mode, allowing also the manual mode for emergency situations. One of the main advantages of using it is it’s being completely ecological: the disinfectant liquid does not give off toxic substances. The treatment process also purifies all liquids without leaving residues on board. It does not need a sludge tank installed on the boat. It is compact, fully automatic and offers emergency operation. In standard mode it can be used with 230/400 V power, but other voltages may be requested. Another leading Tecnicomar product is the new line of air sanitisers, designed in-house by the company, using the patented photohydroionisation process. This procedure triggers an advanced oxidation reaction when the light energy of the ultraviolet cell reacts with oxygen, ozone, a small amount of humidity in the air and a three-metal hydrated catalyser. This reaction creates sanitising irons, such as hydroperoxides and superoxides, which are emitted by the system into the surrounding air. Treating the air prevents the growth of bacteria and mould, reduces odours and volatile organic compounds. Tecnicomar has the new UNI EN ISO 9001/2015 quality certificate and OHSAS 18001:2007 certification, fully protecting the high quality of its entire production line.